Not much known beyond its borders Swiss Watch Brand Bandelier recently unveiled its “IPL Trophy” collection. 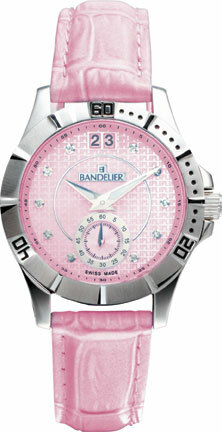 The collection consists of trendy and sophisticated men’s and ladies watches. “The Trophy” line of products is modeled around the league and its teams and delivers the high quality precision and finesse in the true tradition of Swiss premium watches. The Indian Premier League had earlier announced the appointment of Bandelier 1878 of Geneva (Switzerland) as the official watch licensee for the league. The IPL Trophy collection has four variants – a large, a medium and 2 small. In all there will be 29 unique watches which will comprise of 3 watches (all steel 2 male & 1 female) uniquely for IPL & each of the 8 teams (9 x 3) and 2 female watches (leather strap in Pink or Sky Blue & diamonds) which will be only for IPL. The Swiss made watch has a reliable quartz movement, with chronograph displaying minutes and hours. The 9 variant dials have the IPL or Team colours on the Tachymeter (from 1 to 20 minutes) while case back is engraved with the individual team or IPL logo. The 2 female watches have the IPL colour on the Tachymeter and the case back has the IPL logo. The turning bezel on the men’s models also allows for a countdown function of the overs in a T20 cricket match. The Indian Premier League had earlier announced the appointment of Bandelier 1878 of Geneva, Switzerland as the official watch licensee for the league. The watch is distributed by Finex Lifestyle Works. This marks the first time in world cricket, that a Swiss Watch Brand will collaborate with any cricketing league to create and market a collection of Swiss made watches and men’s accessories through this exclusive license partnership. The watches have anti reflection scratch-resistant sapphire crystal and 2 years guarantee against manufacturing defects. 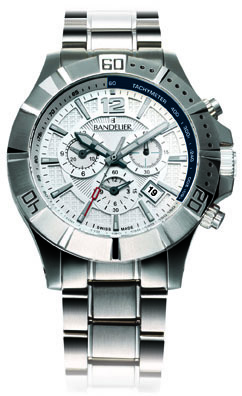 The watches are water resistant till 100 metres, with screw down pushers for added security against water & humidity. Bandelier 1878’s IPL Trophy collection will be available at leading watch retailers, select department stores and through both the IPL and Bandelier websites.